Mallet finger is a common injury in cricket caused by the ball hitting the tip of the finger. The end of the finger is violently bent by the impact, resulting in a rupture of the tendon that straightens the end joint (known as the distal joint). In addition to the symptoms of pain and swelling of the affected joint, when a mallet finger injury occurs the tip of the finger will remain in a downward bent position – i.e. it will ‘droop’ – and it won’t be possible to straighten it. It is not recommended that a mallet finger injury is treated at home, so (as with all of the types of finger injuries outlined in this post) it’s always necessary to seek medical attention. Delaying a visit to a doctor for any of these injuries could make the treatment more difficult and may lead to delayed recovery or permanent stiffness and loss of mobility in the injured finger joint. 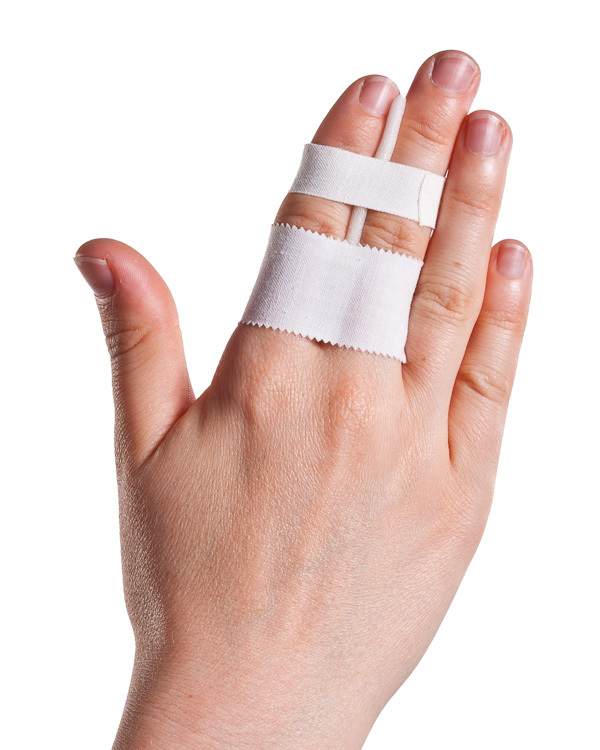 Treatment for a mallet finger injury will usually involve the splinting the finger in a straight position for up to two months using a specially designed mallet finger splint. Keeping the finger in this position allows the tendon to reattach to the bone. Once the splint is removed the treatment will focus on exercises and therapy to straighten the finger and improve mobility. It’s relatively common for cricketers to sustain a dislocated finger and this type of injury normally happens as a result of the cricket ball striking the end of the finger. A joint dislocation is when a bone in the finger is moved (dislocated) from its socket causing damage to the tissue around the joint. It’s usually obvious when a finger has been dislocated as it won’t be in a normal anatomical position: it may be bent at a strange angle or deformed. Common symptoms are intense pain, swelling and a loss of function in the finger. In severe cases symptoms may include tingling or numbness, or a break in the skin where the dislocation has occurred. In these cases the injured person should visit an emergency department as soon as possible. The swelling can be reduced immediately using an ice pack and by raising the injured hand above the level of the heart. It’s important to seek medical attention for a full diagnosis and correct treatment of this injury. The doctor will need to correct the position of the finger be realigning the dislocated bones. The PRICE protocol should be followed for the first few days after the injury. A splint, or buddy taping, will be used to support and protect the injured finger for 3-6 weeks. To help to reduce the chance of decreased mobility in the finger it’s important to carry out any exercises recommended by the doctor or physiotherapist. The symptoms of a sprain are pain and stiffness in the finger joint with a degree of swelling and in some cases bruising. The amount of swelling is usually an indication of how severe the injury is. To treat this type of injury immediately follow the PRICE protocol. As soon as possible the injury should be assessed by a doctor who will decide on the appropriate course of treatment. Cold therapy using finger cold packs and compressive bandaging using cohesive bandage can help to reduce the swelling and pain. The joint may be rested and supported using a splint in the initial phase of recovery, however, with this type of sprain it’s important to move the joint quickly after the period of immobilisation. Specific exercises for keeping the joint flexible will normally be recommended as part of the course of treatment. Buddy taping may also be recommended by the physiotherapist/doctor as it is a good way of protecting the finger while allowing a normal range of movement. Thanks for reading. 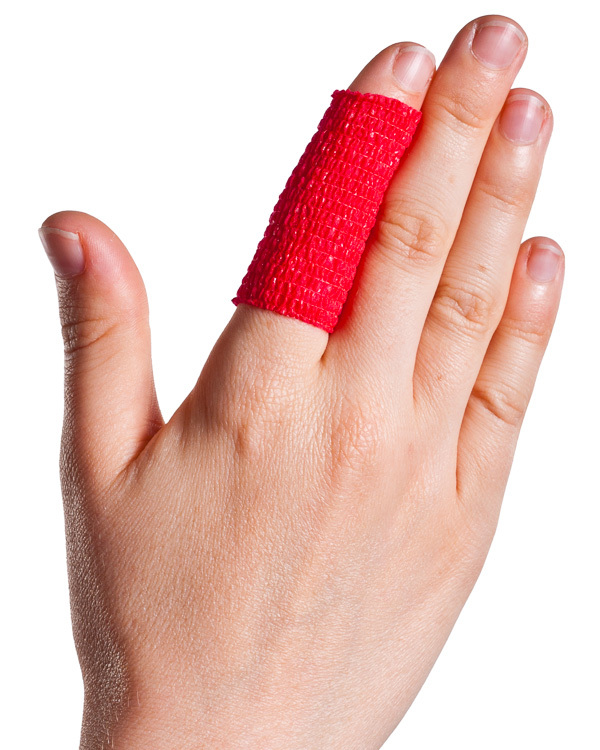 Click here to view our range of finger injury products. Hurt my index finger last week playing cricket when i was only able to catch the ball with more pressure on the index finger. I had a swollen finger the next day now its the 6 th day and the swelling hasn’t gone away fully and feels so stiff and a light pain when I try to bend it. Is it normal to still feel like this on the 6th day? Ouch! We can’t really offer specific medical advice on this blog. But obviously, if you don’t recover full, pain-free movement of the finger you should have it checked out by a doctor. I had a little finger fracture while playing cricket using tennis ball. So can we have fractures even with Tennis ball. yeah..that’s possible to have fracture. Obviously, no tape will provide anything like complete protection to the finger. But it may help provide a little bit of temporary support if you’re concerned about weakness in the finger. A cricket ball hit between my last two fingers yesterday,now its swollen now my index finger is bent forward what do u recommend? Initially – ice the injury and rest the finger for 2 or 3 days.. After that, if you find you can’t straighten the finger or move it normally you should seek medical advice. If you’re still in pain and have not recovered full movement after 3 months, it seems likely there is lasting damage to the structures of the finger. Unfortunately, that’s not really a ‘first aid’ issue anymore. You would need to see a doctor to get qualified medical treatment.